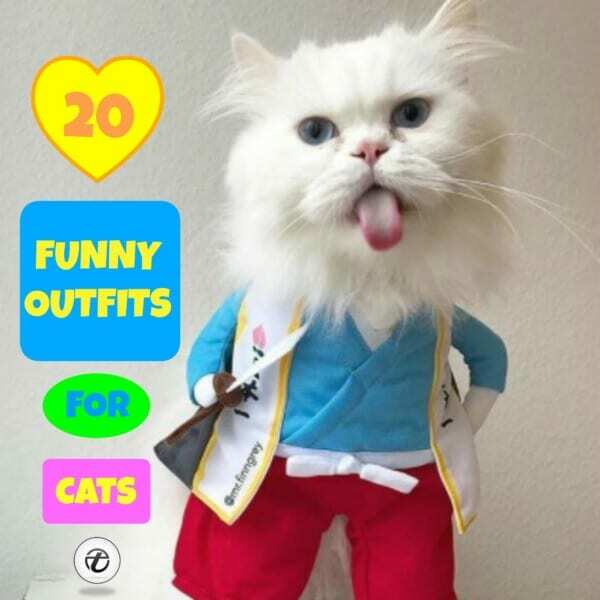 Funny Outfits For Cats – Pet keepers all over the world unanimously agree that one of the most fun things they do to their pets is dress them up. Whether it’s a cat or a dog, the animal becomes ten times cuter instantly with layers wrapped around them. So, to give you more ideas, we are here to talk about funny outfits for your cats! There’s no denying that cats live like royalty. They do what they want and live on their own terms like Kings and Queens. So go ahead and treat them like the royalty that they are and get them some cute outfits to flaunt their cuteness and make everyone around them giggle! A chef – you can go out there and get the perfect chef hat and a pretty apron for your cat to wear. And in case you’re planning on taking pictures, do not forget to add a spatula in the frame! A police officer – you can get a navy blue or black uniform with a badge and cap to make it look serious. A professor – make your cat look like a professor by making it wear a tie and putting those classic nerdy round framed glasses on its nose. 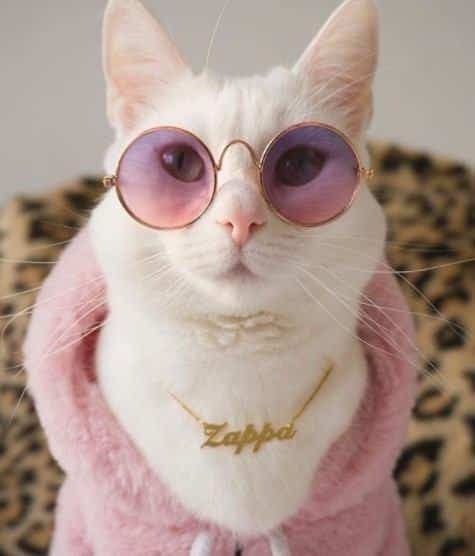 Once you have plenty of outfits for you cat, you can start thinking about different ways to accessorize it and glam your cat up. Cute hats, fedora, sunglasses, chains, anklets, the list is endless. You can make your cat wear matching outfits and jewelry too. Like owner, like pet. Sounds nice, doesn’t it? To give you more outfit ideas we have rounded up 20 funniest outfits for cats. Check them out! Who doesn’t like dolling up their pets? Check out these super cool glasses and and a cute jewelry piece with the cat’s name on it! Here are 20 Most Funny Clothes for Dogs. Now this is one bold outfit for you to dress up your cat in! This police hat, uniform and the cat’s serious expressions make one funny combo! Get your cat dressed up in blue scrubs and a white overall (that you can either buy or stitch yourself) and your cat is ready to go save lives! Make your cat look cuter with a buzzing bumble bee black and yellow costume! You can also add a black hat with yellow pom-poms to complete the look. Another way to dress up your cat is to simply get a pretty designed scarf for your cat that can be worn all year round! This chef attire makes one funny outfit for cats! All you have to do is simply get a white cloth and stitch it into a chef hat, with a printed border. If you need formal outfits for formal occasions, so do your cats! This cat outfit with a black and white tux and a hat is absolutely funny! You can make a cute hat yourself for your dearest cat such as this one! Nerdy glasses are in trend for cats as much as they are for their owners! How funny and cool is this outfit with a tie, collar and glasses? This unicorn outfit will make you want to go out there and get a similar one for your cat right now! In winters, you can keep your cat cozy in a super duper cute sheep costume that will totally melt everyone’s hearts! You just wont be able to resist laughing at this one! Check out this cute little cat looking like a Chinese princess! Also have a look at these 20 Christmas Costumes For Cats. Know what’s cuter than a minion? Your own cat looking like a minion! Dress it up in a minion costume and watch it steal all the attention! Whether you just want to play dress up with your cat or actually take it to a race, this costume is absolutely perfect! Isn’t this outfit the funniest? You can dress your cat in a sailor costume with a cute tie and badge and don’t forget the hat! Everybody loves dressing up on Christmas and so do your cats! You can find a variety of Christmas hats, sweaters and other cute accessories to make your cat stand out! We hope that this article gave you some interesting ideas for you to dress up your much loved cat. Have lots of fun dressing your cat up and don’t forget to give us your feedback in the comments section!